Having difficulties getting that vinyl window installed? Refer to the manufacturer’s recommendations and give these tips a shot. When taking the time to install a vinyl window, it’s important that before you begin, you familiarize yourself with what the manufacturer recommends. There’s no better official on what to do than the people who created the product. With that in mind, there are generally a few practices that are universally accepted and can help reduce leaks or damage. Try out these tips for vinyl window installation. Make sure the rough size of the opening is up to the manufacturer’s standard. Typically, you will need an opening around half an inch larger than the window frame. After that, center the window from left to right with a 1/4th inch gap on either side. For best results, install the window on a continuous level base and avoid shimming the sill as you do so. 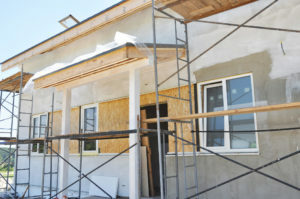 After this is done, install flexible flashing around the perimeter of your window opening. More flexible flashing is made from polyethylene or rubberized asphalt and comes in 9-inch rolls. Be sure that the flashing at the side of the rough opening extends over the flashing at the bottom for best results. Remember, you want to lap your flashing in the proper sequence to make sure you avoid unwanted moisture buildup that could cause problems down the line. As usual, make sure you follow the manufacturer’s instructions when fastening the nailing fins. Be careful here, as its possible to puncture the nailing fun with extra holes when you install your housewrap, exterior trim, or siding. In any case, make sure fasteners are held away from your nailing fin. Make sure to leave expansion between your siding in the window, usually a fourth of an inch. If you’re doing the job in the hot summer weather we’ve been having, the gap may need to be a little smaller. The opposite is true if you’re performing installation in the winter, though this is generally not recommended. This entry was posted on Friday, August 10th, 2018 at 2:36 pm. Both comments and pings are currently closed.